The April 2009 edition of the CGIAR E-News has just been released and is now available- see CGIAR News April 2009. Of particular interest in this issue is an article prepared by Nadia Manning-Thomas, project Leader of the Knowledge Sharing in Research Project, on the recently held Knowledge Share Fair. Held in FAO HQ in Rome in January 2009, this innovative event was the first of its kind, organised by FAO, CGIAR (through the ICT-KM program), Bioversity, IFAD and WFP. The concept of paying it forward fits in nicely with Vanessa Meadu’s idea of the nature of true knowledge sharing. She strongly believes that when you benefit from someone else’s experiences and knowledge, you can optimize that gift by passing it onto others who can profit from it, too. As such, it’s possible for a single knowledge sharing event to create a ripple effect capable of touching a large number of people outside of the event. Not only did this Nairobi-based Communications and Project Officer benefit from the recent Share Fair held at FAO Headquarters in Rome, but she also has great respect for the CGIAR’s burgeoning Knowledge Sharing community. “It’s certainly advantageous to have a knowledge sharing community in the CGIAR,” she said. “Among other things, the members provide a great support system. If I have a question about, say, blogging, I can email Simone Staiger-Rivas (Project Leader of the ICT-KM Program’s Institutional Knowledge Sharing project), and if I have a question about technology, I can email someone else for assistance. It’s good to have someone to turn to for advice. This dynamic woman admits that the Share Fair has already had a spin-off effect at her Center. “The Fair has been a big incentive towards a movement for better knowledge sharing at ICRAF,” she explained. “Since the event, I’ve held two seminars, one of which I wrote about on the ICT-KM Program’s blog. I conducted a small lunchtime session with the Center’s communications unit and shared with them some of the experiences we had with newsletters and blogging for the ASB Partnership for the Tropical Forest Margins (ASB), a CGIAR System-wide program. “I then conducted an open session for the entire ICRAF campus called Blogging for Impact. I talked about how the ASB blog has been used to enhance dissemination and knowledge about our research and our activities. I also gave participants information about our web stats and publication downloads, to show the tangible impact it’s had on research dissemination. This session was extremely well attended. We even had people coming in from off-campus. Most people attending had heard of blogs and had read them, but they’d never had experience using them in their research and in their project activities. I’d say that for about 90% of the people this was a fairly new concept. Getting back to the Share Fair … Vanessa also shared some ideas and insights at this event. Drawing on her experience coordinating and distributing the monthly email newsletter for the ASB partnership, Vanessa participated in a panel session called E-News is not Old News, which was based on a proposal she developed with her Nairobi-based colleagues at ICRAF, Gender & Diversity, and CIMMYT. The panel responded to questions about the strategic use of email newsletters to reach a broad audience, specifically in the African context, and also discussed this tool as an appropriate means of reaching people who may not have regular or fast Internet access. 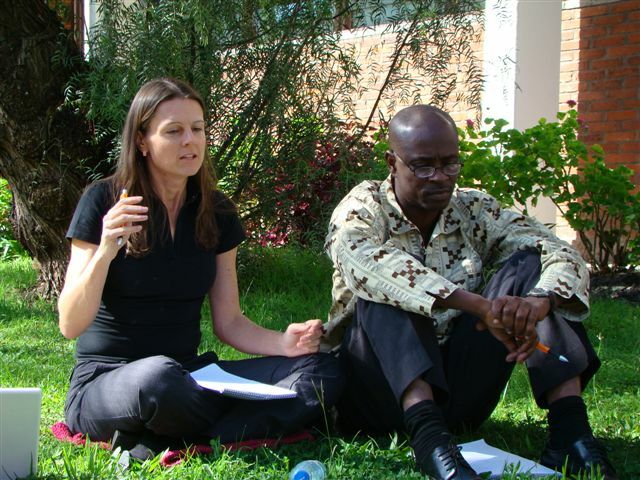 As the interview wound down, Vanessa contemplated the impact knowledge sharing could have on the larger CGIAR. “There is such a wealth of knowledge and expertise within the Centers, and it’s vital that we encourage people to learn from each other, and let them know about the resources that are out there and the good practices they can build on. We can have a high standard of knowledge sharing throughout the CGIAR System if we capitalize on these kinds of events and keep the momentum going at each of our Centers. When Tonya Schuetz arrived at the Share Fair in Rome earlier this year, her main goal was to see and do as much as possible. She was especially keen to expose herself to new knowledge sharing methodologies and talk to as many people as she could about their experiences. However, after looking at the event’s packed program, she realized that she wouldn’t be able to cover everything that piqued her interest. At least, not on her own. That’s when her resourcefulness came into play. In between attending sessions, Tonya also presented the work of a pilot project she had led under the ICT-KM Program’s Knowledge Sharing in Research project. Tonya also talked about the project’s poster presentation, which showed the different knowledge sharing methodologies that had been used to support the research and how the project had benefited from them. “You could say it was a knowledge sharing methodology mix”, concluded Tonya. Despite the success of the project, Tonya did wonder if they’d used the right mix of methodologies to support their research in an optimal way, a topic she had talked about during another Share Fair session, where she was one of four presenters. Like many Share Fair participants, Tonya was glad to see PowerPoint presentations taking a back seat for a change. Of course, Tonya is aware that some people still think that such methodologies cannot possibly get across the same amount of information as a PowerPoint presentation can. Although the Share Fair was a resounding success, Tonya feels that many people are not yet confident enough to do things in a different way, especially when the support they received while initiating a methodology is no longer there. Meena was also asked to facilitate two sessions at the Fair. To make sure she carried out the tasks assigned to her with ease, she began familiarizing herself with the content of the presentations as soon as she’d agreed to be a facilitator and was immediately impressed by the originality of the methodology highlighted in one of the video presentations. Share Fair participants who sat in on this particular presentation were shown a video of a water contest in Bolivia – an event that helped rural communities to capture and share local good practices. Finalist in the water contest had their practices documented by a film team, and the resulting videos were then shown at an exposition fair in the country. Showcasing the videos in such a way enabled the exchange of local knowledge and experiences on good water use practices. The contest also provided an opportunity to link the rural poor to national policy level and other development institutions. The other session Meena facilitated involved a successful pilot project in Bangladesh that is now looking to upscale its activities with input from others. The project aims to educate policy makers in Bangladesh and seeks their involvement to bring about change. During this Share Fair session, participants were asked to give their comments and views on the project’s goals. Other than facilitating her two events, Meena also attended some of the Fair’s other sessions. The Fair also benefited Meena in ways that will help her with her work at The WorldFish Center. Meena also commented on the impact the Share Fair and other knowledge sharing activities might have on the CGIAR as a system. Time for another buzz, perhaps. Thursday, 22 Jan 09. For the first session I attended the technical session on ‘Technical Tools on RSS’ in the E-learning Lab. The session was facilitated by Pier Andrea Pirani (Euforic) and Romolo Tassone (FAO). We were joined by Nancy White, facilitator extraordinaire, to help us on the practical exercise. The session gave us an introduction to the RSS and a very useful practical session on how to sign up for an RSS reader, where to find RSS on a website, how to gather RSS feeds and how to subscribe to websites and blogs. In no time, everyone was busy building up their own RSS! – RSS is a way to get a quick list of the latest story headlines from all your favorites websites and blogs. – RSS makes it a lot easier and faster for you to get the stories you care about from around the web without having to visit them all individually. – Look for an RSS symbol on a website, blog or browser window to ‘subscribe’ to their RSS list feed. Via RSS, we can pick and choose what we need, take what we are interested in, and use RSS to make navigating the web content a lot more precise and suited to our individual needs. So what is RSS? —- I am ready for some stories! Geoff, who is also the knowledge management coach for the WHO, UNDP, the World Bank and the Swiss Development Agency, delivered the keynote speech at the Opening Ceremony of the recently held Share Fair organized by Bioversity International, the CGIAR ICT-KM Program, FAO, IFAD and WFP. Held at FAO headquarters in Rome, Italy, from the 20th to 22nd January 2009, the Fair also saw Geoff convening some sessions on Knowledge Management. The ICT-KM Program’s Nadia Manning-Thomas caught up with Geoff at the end of the Share Fair to capture his impressions of the event, the CGIAR and its knowledge sharing successes, challenges and opportunities. Nadia Manning-Thomas: First off, let me ask if you enjoyed the Share Fair and if it was what you’d expected it to be? Geoff Parcell: It was fun and pretty much what I’d expected. I attended the Dare to Share Fair at SDC (Swiss Agency for Development and Cooperation) and can see that a lot was used from that model. NMT: What was the highlight of the Share Fair for you? NMT: What were the challenges, if any, that you felt or observed during the event? GP (chuckling and pointing to the meeting rooms with their screwed-down furniture): This is not particularly conducive to this type of event, its activities and goals. This shows that organizations like yours need to be moving towards more flexible room setups with small tables to allow for small group work and alternative and effective methods of sharing knowledge. During the event, I found that there is still a mix of attitudes when it comes to knowledge management and sharing. Essentially knowledge management is an attitude change from ‘we are the experts, telling others what to do’ to ‘let’s look at what’s going on and see how to support those efforts.’ The problem is that people feel threatened by change. What they don’t realize is that it can be a very powerful thing to facilitate processes rather than dictating or leading them. All of the organizations involved in this Share Fair can no longer think of themselves as the authority on food and agriculture. People will get information wherever they can. And especially with new and advancing technologies, information is now available in many more ways than it has been before. NMT: So what is their role now? GP: These organizations need to see a new role for themselves in providing platforms, in facilitating the processes of getting people connected. NMT: The big question that always comes up at events like this focused on new ways of operating is that it is difficult to bring about change, difficult to get organizations and people to make the shift. What are your thoughts on how to encourage and bring about change? GP: We need to tell stories; stories about how these new approaches are being used and are working. We need to encourage people to follow examples—such as the activities carried out at this Share Fair. We should be making connections happen and work. NMT: Coming from the CGIAR, I would like to know if you have any impressions about the CGIAR System in relation to knowledge sharing. GP: I didn’t know much about the CGIAR before this event, but after attending some sessions that presented CGIAR projects and activities, seeing booths with CGIAR materials, and talking to some CGIAR staff, I got some impressions about the System and its successes and needs related to knowledge sharing. I was struck by something in particular I heard about the CGIAR and knowledge management strategies. When I heard that each of the 15 Centers in the CGIAR System plans to write or has written its own knowledge management strategy, I thought, this is crazy! There should only be one strategy developed for the whole System. A knowledge management strategy is mostly about process so it doesn’t matter about differences in content. I assume that most Centers have similar knowledge management goals, so the focus should be on the knowledge management process to achieve those goals – and applying the process to particular content. It is about getting people to have the right conversations. It’s also important to find ways to have learning incorporated into any organization’s project or activity – before, during and after the event. Sometimes it is just simple things that we need to change or adopt, and importantly we must keep our minds open to things that can be transferable to our needs and situations, even if they come from very different sectors, groups, or situations. We’re not as different as we think we are. NMT: There is often a lot of (differing) perspectives on what knowledge sharing is. Do you have a definition that you use? GP: Knowledge is whatever we use to get action. Reports may be fulfilling for the writers but the goal of your organizations is to reduce hunger; therefore, we need to make sure that what we generate gets to the point of application. The situation is like a massive supply chain along which knowledge must flow. Although, you may not be responsible for all parts of the chain, you need to find ways to work together; to make the right connections to make sure that knowledge gets to the end. My model for knowledge management is using knowledge in service of delivering results. Thank you to Simone Staiger and Meena Arivananthan who also took part in the interview. Thank you to Mary Schneider for adding the journalistic touch to this piece. …then you should have attended the session on ‘KM strategies and activities for rural development’ that took place in the India Room on Thursday 22nd January from 13:45-15:00 at the Share Fair—or you can at least find out a bit of what went on in the session by reading this blog post.